More plot . . . more puns . . . more panther! the movie. Many were trimmed for pacing and other considerations. This panther is now as pink as it will ever get. the movie. Many were trimmed for pacing and other considerations. - Extended version of the soccer match that includes a fight between Bizu and Gluant. - Dreyfus contemplates his dilemma before deciding to give the case to Clouseau. The opening credits now appear after this scene. - Dreyfus describes the case to his investigative team before inviting Clouseau in. - Clouseau destroys the arch in Dreyfus’ office during their first meeting. A brief portion of the original scene that had to be removed to accommodate the new footage is included as an easter egg right before the main part of the end credits. - Dreyfus watches a television news report of Clouseau’s speech in disgust. - Clouseau accosts Bizu at the practice field. - Clouseau destroys the arch again, and it’s one mishap after another for Dreyfus. - Tied to a mast in a rainstorm, Clouseau struggles to correct his pronunciation. 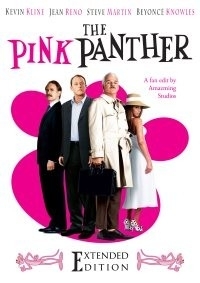 - Clouseau hangs onto the back of the car while Ponton drives to the presidential palace, with added underscoring of the Pink Panther theme remix from the first part of the end credits. - Larocque threatens Xania in her dressing room, while she is getting ready for her performance. - Clouseau’s nightmarish flight, while too surreal to fit into the movie itself, was added as a post-credits sequence. I really enjoyed this one. The only thing I think may have made the one inserted scene in the office with the doorway falling apart would’ve been to brighten the picture. It would have blended better with the rest. Other than that, it blended pretty well overall. I liked the movie more than I thought I would, and this is the version to watch. Thanks for a fun edit. a well executed extended edition here folks. unfortunately the theatrical version is painful – so this just adds to the wounds! still a fun watch if only to see how the PP is re-imagined.